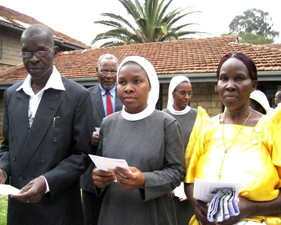 On the day before her birthday, Mother Mary gifted our community with a new member, Sr. Sylivia, OSB who made her first profession of vows on September 7, 2013 in the Sacred Heart Priory, Karen, Nairobi. Five of her family members, including her mother, maternal uncle and aunts, went along with Sr. Ruth, OSB to witness the celebration. It was indeed a joyful day of celebration which started with the Sisters’ dawn serenade to the bride. At 10:00a.m., the celebration of Holy Mass began at the Sisters’ chapel. This was followed by a festive lunch and program which featured traditional dances participated in by those present. Apart from the blessing of good weather, the sisters’ labor to make the day special and meaningful for the bride had contributed much to the success of the celebration. The opportunity to thank the Sisters came to the newly professed sister after supper. She read a short story and performed a song to the sisters as an expression of her heartfelt gratitude. The community of Jinja is truly grateful to the Priory of Nairobi for the care and formation of our young sisters.